Progress. It IS Happening, Honest. What's that saying about construction projects? Figure twice the cost, and three times the amount of time needed for completion? I had hoped to get the emergency generator installed and ready by the time Winter hit. At the rate we're going, it looks like we'll be doing well to have it ready by Spring. That's all right, tho, as we're making progress bit by bit. 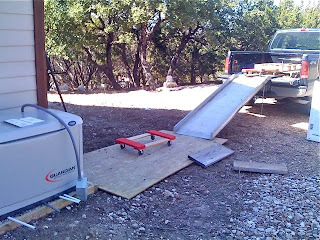 The most recent mile-marker was getting the generator unit onto the property and installed on the foundation pad. "Sorry, we don't do the physical install", the electrician said "due to insurance reasons." The unit is over 500 pounds, so I can't say that I blame him. "You could hire a bunch of day-laborers, or rent a forklift." On repeating the suggestion, Spouse replied, "If we could just get a couple of furniture dollies and maybe a ramp..."
So I spoke with the guys at work. Turns out, they DID have a ramp and a couple of furniture dollies we could borrow. Spouse traded his car for the use of his Uncle's pickup for the day, and we got the generator forklifted onto the truck from the feedstore warehouse. Once home, Spouse found a bunch of round metal poles, levered the unit up and slid the poles under, then was able to roll the unit onto a furniture dolly. Down the ramp the unit was pushed, then rolled over to the foundation pad. Once more, the unit was levered up, poles put down, and the unit rolled over onto the pad. Just us two. No forklift, no day laborers, no professionals of any sort. Darn proud of Spouse for coming up with this idea. He gives credit to his Dad, who moved a concrete picnic bench in the same manner. 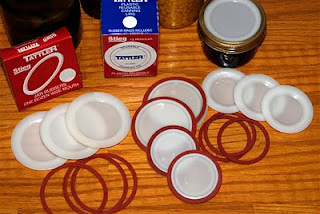 I was reading Organic Gardening magazine the other day, and ran across an article that stated “Canning jar lids from the brands Ball, Kerr, Golden Harvest, and Bernardin are coated with bisphenol A”. Wait, isn't that every brand of canning lid made in the USA? Furthermore, Consumer Reports found BPA in 19 name-brand canned foods (that you can get off the shelf in any grocery store), and even in some cans marked "BPA Free". The FDA is now expressing concern (as of January 2010) about the potential effects BPA exposure may have, which mimics the hormone estrogen and may cause reproductive abnormalities and increase the risk of cancer and diabetes. Well, sh*t. You try to eat right, exercise, and do a little home canning, but you still can't get away from the crapola. Started researching whether there were any other canning lids that were BPA-free. Wecks has gorgeous jars with rubber gaskets and glass lids, but are only good for water-bath canning (jams & high acid food processing). If you want to can meats or other things needing pressure-canning, Wecks won't work. Quattro Stagioni lids (which I don't even know if they'll work with standard Ball or Kerr jars like I have) are also BPA-free and can be used in a pressure canner, but cost a $1.29 for a measly two lids. 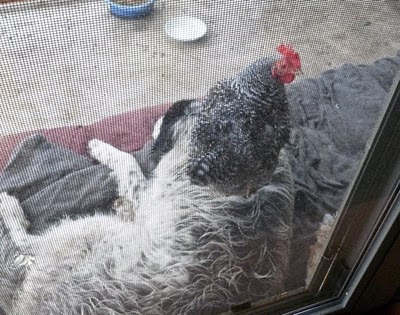 Spouse snapped these photos of Frau the Barred Plymouth Rock hen resting herself upon Bandit, the much put-upon Great Pyrenees livestock guardian dog. 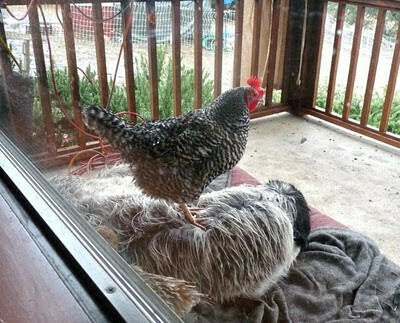 I mean, heck - the birds eat her food, poop on her bed, and now have the temerity to perch upon her very body! No respect, I tell ya!